Keeping Your New Year's Resolutions on Vacation! March is almost here and many people have completely given up on their “healthy” New Year’s resolutions by now! The good news is that you don’t have to throw fitness to the wind, even if you are planning to go on vacation! If you are steadfast on keeping your health and fitness New Year’s goals while traveling this year, many hotels and resorts are incorporating programs to help you stay on track. Wellness has become more than the typical spa experience with facials, seaweed wraps and hot stone massage. Health and wellness have also moved into the hotel restaurant. Hotel cafes and restaurants are beginning to include healthier food choices and options that cater to dietary restrictions like gluten free, vegan, Paleo and vegetarian as these styles of eating are becoming more common. Working out and eating well now go hand in hand with traveling. 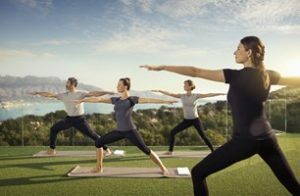 All around the world fitness, health and wellness programs are popping up in hotels, spas and resorts. There are complete vacation packages that focus on health and wellness. So, going on vacation is no longer an excuse to abandon your daily health regime. Where as “wellness” retreats used to imply spa services and meditation, the wellness experience now encompasses more intense physical fitness. 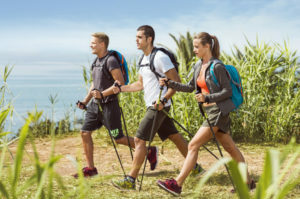 Vacations that are centered around hiking and yoga can be found more readily than ever before as well as spin classes, beach volleyball, Zumba and Pilates. Some resort packages include a visit with a health professional or nutritionist who will provide a complete health assessment at the beginning of your stay to help set personal goals. In some cases this person may also work directly with the culinary team to assist you with your personalized menu plan. More than merely helping you to maintain your fitness objectives, you can also book a vacation that actually propels you forward. You may be looking for cardio, strength and sport or a combination of mind and body renewal. Fusion Fitness Holidays allows you to customize and set a personalized itinerary based on specific goals. Your custom holiday may include Thai boxing, Ashtanga yoga, dancing or beach power walks. These comprehensive wellness programs treat mind, body and spirit! 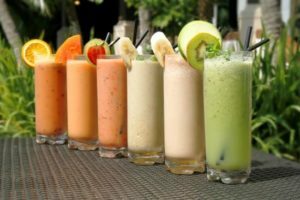 The first ever “Healthy Hour” is now a thing at the Bucti and Tara Beach Resort in Aruba! Instead of cocktails, guests can enjoy all of the mingling without all of the calories! Serving up craft mock-tails, vitamin packed smoothies and wholesome snacks poolside is the new happy hour! 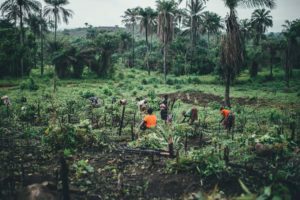 If your New Year’s resolution is to reduce your stress level, then you may need to visit this “summer camp for the soul” at TreeCasa in Nicaragua. The destination itself is nestled among the kapok trees and said to have sacred energy and healing properties. The entire property is considered sustainable. The resort restaurant is “farm to table” and serves only food harvested from the properties own organic gardens and orchards. Daily yoga classes, horseback riding and walking through the forest leave plenty of time for reflection. Hillside decks high among the trees offer a uniquely peaceful environment not found anywhere else. Whether or not you have abandoned your New Year’s resolutions for health and fitness, there is still time to reignite them and even incorporate them into your next vacation! This entry was posted in cocktails, culture, General, healthy lifestyle, hotels and tagged healthy lifestyle by admin. Bookmark the permalink.